60% of respondents say they use technological tools to manage their ads on several platforms at the same time, while 15% use them to manage the keys. This study, prepared by the vacation rental platform Spain-Holiday.com, aims to know how the use and penetration of technological tools in holiday rentals in Spain is. According to the report "Use of technological tools in the holiday rental", prepared by Spain-Holiday.com, 25% of the managers of tourist homes could not continue with their activity without the use of specific technological tools of the holiday rental, while that 50% affirm that they could continue with their activity but with many difficulties. Likewise, the conclusions of this report show that 60% of respondents use technology to manage advertisements for tourist homes on several platforms at once, the so-called "channel manager", while only 15% use it for management and delivery of the keys "check-in". 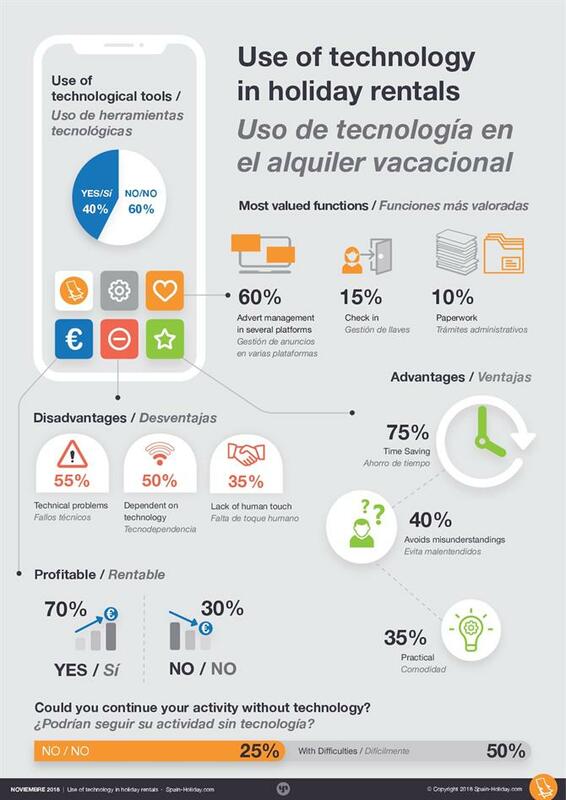 This survey, conducted by Spain-Holiday.com among its users in the months of June and July 2018, and whose conclusions are based on a sample of 500 responses, aims to know what and how are the technological tools that most professionals use holiday rental, and which are the functions that value most of them. For Jannich Petersen, CEO of Spain-Holiday.com, the conclusions of this survey "help platforms like ours to know the technological needs of owners and managers of tourist homes; they favour the creation of more efficient solutions and foster synergies among all of us who operate in this sector ". The data from the survey on the "Use of technological tools in the holiday rental" of Spain-Holiday.com show that the advantages that the respondents see in the use of technology are: important time saving (75%), avoids misunderstandings (40%), speed (35%), comfort (35%). On the other hand, the respondents point out that technical failures, lack of human touch and techno-dependence are the main disadvantages found in the use of technology for the management of their holiday rental activity.